Blog — Nick Engel & Co.
Fine Jewelry Design, Restoration & Repair. Based in San Francisco, offering handmade custom jewelry for weddings and special occasions. Our custom designs combine your personality with our artistry to create something beautiful and unique to treasure for a lifetime. If you can dream it, Nick can craft it. Pascal and Ashley first met because of UC Berkeley, even though neither of them studied there. Both have lots of friends who went to Cal and a group of Cal alums put together a "Bar Games League" back in 2010. According to Pascal, "We'd meet up at The Nob Hill Tavern (which has since shut down and is now the Wreck Room) every Wednesday to play bar games: pool, darts, flip cup, beer pong, and quarters. The Nob Hill Tavern was quite the dive. We brought all the cups and ping pong balls, etc. We even brought our own beer pitchers which we would pay to have filled up there." Ashley was on one bar game team and Pascal was on another. They first met over a heated game of quarters, but Pascal didn't muster up the courage to ask her out initially. "About half way through the about 8 week season we were both outside to make calls and it was chilly so I lent her my sweater. Apparently she appreciated it!" On the very last night, Pascal finally asked Ashley out, and the rest is history! Pascal knew he loved Ashley because of the culmination of a lot of little moments together with her. "Coming home to her every day. Cooking dinner with her. Laughing (a lot). At one point I realized that she made me want to be a better person and a better partner. I guess at that point I knew she was the one." When Pascal decided it was time to propose, he planned their 1-year house-iversary party, but it was actually a ruse to get everyone over to celebrate their engagement. "The morning of the party I woke Ashley up really early and told her that I was just excited for the party and wanted to get an early start. We took our dogs up for their usual walk to the very top of Bernal Heights Park, it's a beautiful spot and very meaningful because we purchased our first small condo in Bernal. I had a photographer covertly taking "landscape pictures" up there, then I got down on one knee and proposed!" The party afterwards was great and much merriment ensued. 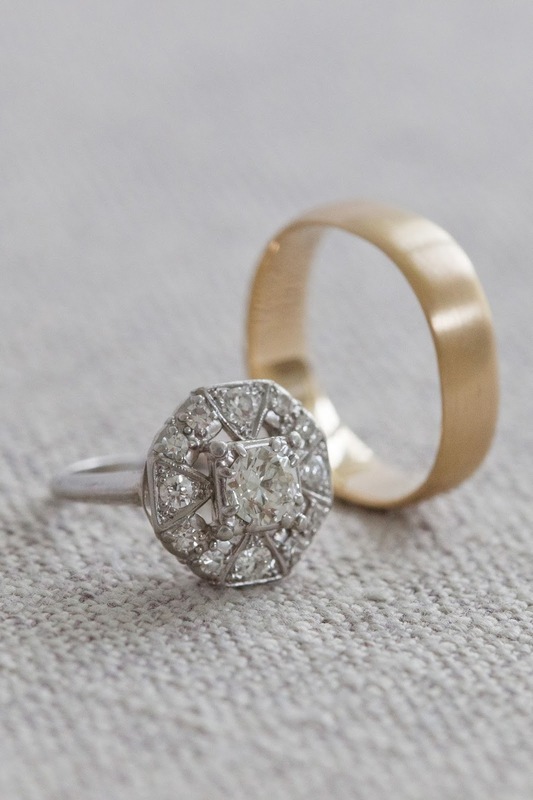 For Ashley's ring, Pascal knew she liked the idea of reusing an old vintage ring and searched for months on Etsy until he found the perfect 1920s art deco cluster, which Ashley loves. When it came time for Pascal to get his wedding band, he was thinking of also using Etsy, but then his good friend Adam got married. 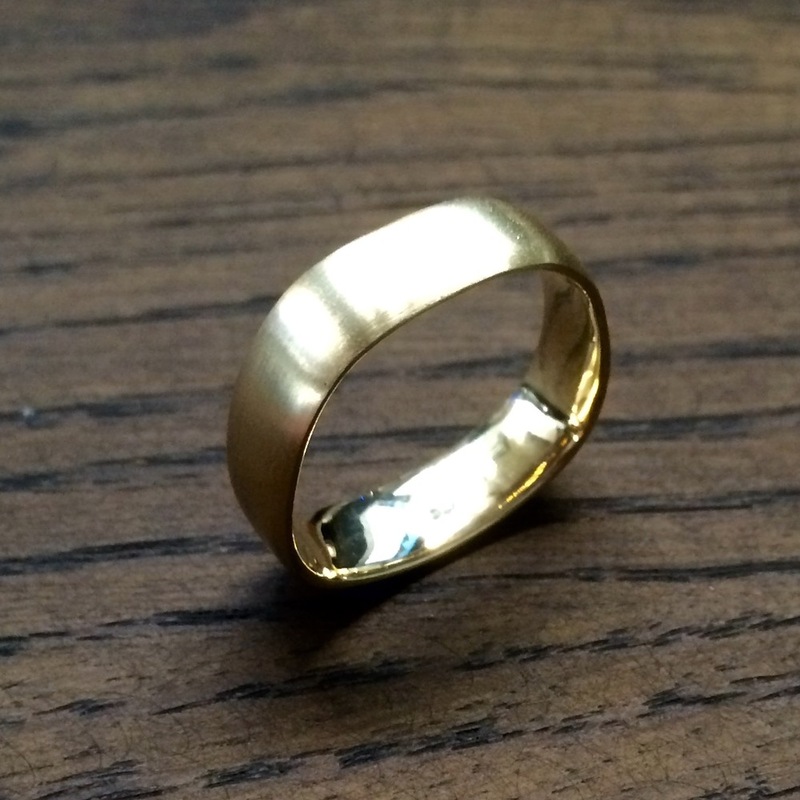 "After seeing Adam's ring I was really impressed. It was so beautiful and unique. I really liked the fact that it's not a perfect circle, but rather something more "finger shaped". I also really liked that it was thin and low profile, I didn't want some big bulky thing on my finger. I wanted it to be a part of me, something that I'd never take off and would never be obtrusive." Along with the fact that Adam had nothing but great things to say about Nick, Pascal decided to pay Nick a visit. "Nick was super straightforward and casual. Not pressuring me at all. I basically told him I just wanted something very simple and classic. He took all the measurements and then in a few weeks I came back in for a fitting. It took a few re-sizes but in the end it fit just right and Nick was really nice about the whole process. He mentioned that Ashley could come in and put the final brushed finish on it, which I really liked. That way she actually had a hand in the making of the ring! You can't say that about most other places." Ashley and Pascal celebrated their wedding in September 2015 in Pascal's hometown of Sonoma. "We did a really small ceremony at Ravenswood Winery, then had a cocktail hour there where we decorated bikes. From there we all rode bikes (Ashley and I on a tandem!) down to my mom's house in Sonoma (only about 2 miles) where we had a larger reception in her back yard. It was just perfect! Super casual, everyone brought a bottle of wine to share, there was a self-serve taco bar, and we all sat on hay bales along one long table that my brother-in-law built. Could not have gone better and I love the ring that Nick made for me. It's classic, simple, and handsome with a unique twist." Kate and Spencer met while attending undergrad at UC Santa Cruz together. They lived next door to each other and became great friends. They began dating towards the end of their time at UCSC. Spencer grew up in San Francisco, so after graduating from Santa Cruz, Kate and Spencer packed up and moved to a little apartment in the Haight. Kate quickly fell in love with San Francisco and they spent the next seven years going to Giants games, camping, and making a life together in San Francisco. When thinking about an engagement ring they realized they both wanted something unique and vintage. Kate had an old ring of her grandmothers. It was large and gaudy, but had a beautiful dark purple amethyst. They set out to find a jeweler to help them create a custom ring that would be perfect for Kate, but that also utilized the significance of her family heirloom. Spencer and Kate were referred to Nick Engel & Co by a friend. Nick was able to help them create a beautiful, repurposed ring, using not only the gemstone, but also gold from the original ring. 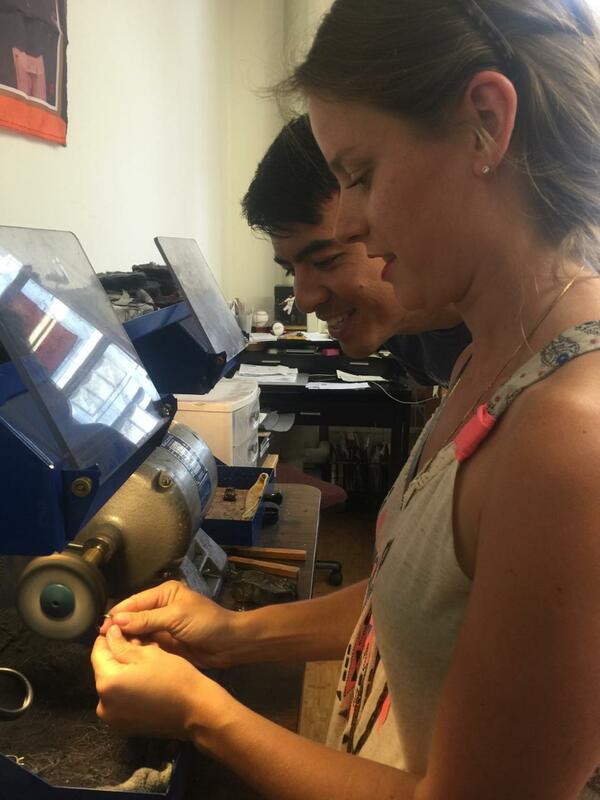 "Nick did a great job working to create the perfect engagement ring. He was able to take the amethyst, recut it, and reuse the gold to turn it into a classic looking ring with the main stone surrounded by diamonds. I was a very unsure customer, as I have no experience in women's jewelry, and Nick was super helpful during every step, providing advice to help me find the right design," shared Spencer. Nick worked with Spencer through various revisions of the ring design in order to get it just right, "Nick was very patient and willing to help throughout the whole process. 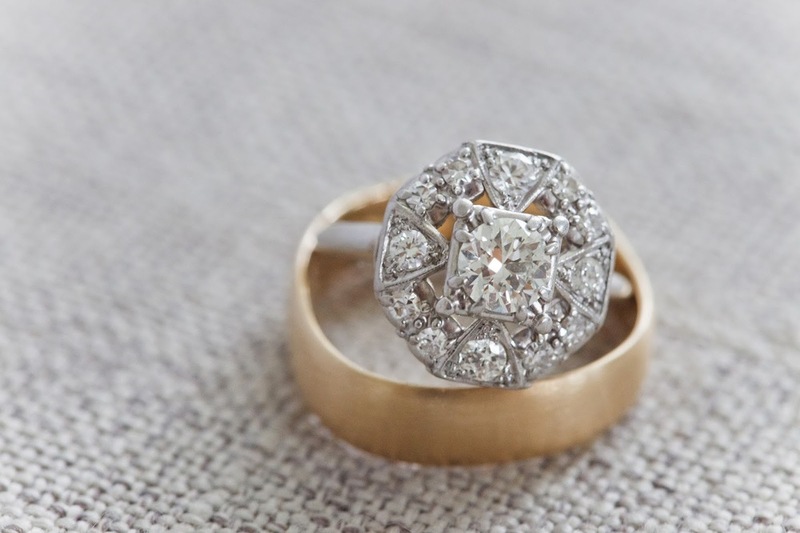 When he finished the ring it was exactly what we had envisioned: with vintage touches, and beautiful yet simple." Spencer and Kate had season tickets to the Giants from 2010 to 2012 and their passion for San Francisco sports has been a big part of their relationship, so Spencer decided that a Giants game would be the perfect place to propose. He waited until the annual fireworks game and proposed as the fireworks went off along McCovey Cove... and Kate said yes! "Nick did a great job. I couldn't be happier with the ring, and Kate completely agrees!" Spencer and Kate were torn between getting married in their beloved San Francisco or Mexico, where they had spent a few summers visiting around Puerto Vallarta, and had really enjoyed the small town of San Pancho. So they decided to do both! They had a civil ceremony at City Hall and then took off to Mexico where they had a beautiful wedding on the beach surrounded by their family and friends. Copyright © Nick Engel & Co.